Typically, reflective curtains are pulled down to at night when the store is closed. During the day, the night covers are discreetly concealed within the cassette housing that is retrofitted to the canopy of the refrigeration cooler. Even though night covers are designed to be used at night, the effects of the thermal barrier remains for up to 15 hours! 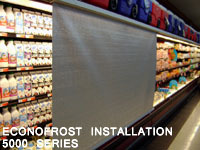 Econofrost night covers were engineered specifically for food applications. The only night cover to use true woven aluminum fabric, retailers notice colder case and product temperatures. Why? Because woven aluminum has the highest reflectivity and lowest emissivity values of any night cover material. Even after Econofrost night covers have been retracted in the morning, the night cover has effectively lowered the temperature of the case and product improving product integrity and appearance. Even better, shoppers can now enjoy a more comfortable shopping experience without having to rush through the cooler case section of the store because the store aisles are freezing! Save Money and Resources Today! reducing the amount of product that must be discounted, re-merchandised, or discarded. Only Econonofrost nightshades are constructed out of a highly specialized woven aluminum material providing the greatest thermal protection from ambient heat and light. Make a difference in your business, save energy, money and keep product fresher, longer! Give us a toll free at 1-800-519-1222 to learn more about the Econofrost line of retrofit and custom night cover products..